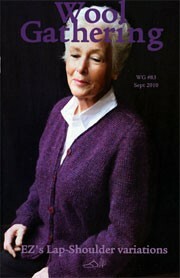 WG#83 features one of Elizabeth Zimmermann's yoke shapes from 1971. Elizabeth's description of the design: "How about a totally new shoulder treatment for a circular seamless sweater? I call it the Lap-Shoulder Sweater because it continually laps over itself. The sleeve laps over the body, then the body laps over the sleeve; finally the back laps over the front."